It wasn't long after Nibbles joined the Scottie Mom family that I developed my theory of how Nibbles got her name. A playful yet sometimes shy pup, Nibbles can be found sitting atop any pillow in the house, paws outstretched and...you guessed it, nibbling away at them. 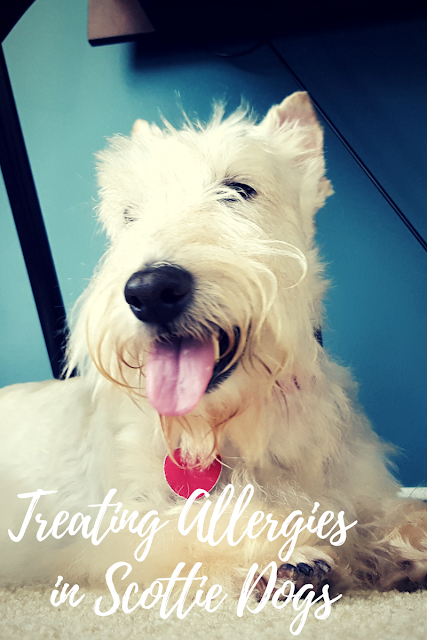 It is a near constant occurrence and something I knew pretty early on that we would have to address with the V-E-T.
As it turns out, the V-E-T thinks the nibbling could be a result of something allergy related. Having suspected that early on, I switched Nibbles to a limited ingredient diet shortly after she and Pudley joined the family thinking a simple diet change would do the trick. It did for Mr. K all those years ago. When the nibbling didn't stop, I consulted the V-E-T once more and learned of a bacteria that is growing in her ears that could be the culprit for her ear issues as well as the excessive nibbling. The V-E-T recommended starting Nibbles on prednisone and clavamox to clear up her ears and maybe help cut down her nibbling on her paws. A week or so into treatment and I've seen mild improvement but not enough. I'll soon start wiping her paws with baby wipes when we return from walks, per the V-E-T's recommendation, and we'll make weekly visits to the V-E-T to have the bacteria cleaned out from her ears in hopes that, too, will help. Aside from the nibbling and not liking frequent visits to the V-E-T, Nibbles hardly seems bothered by her allergies. She runs around the Scottie House stealing toys from the boys and is always ready to alert the troops if so much as a peep is heard just outside one of the doors. Still, I know she can't be too comfortable if she feels she has to nibble on her paws every time she rests atop a pillow. Tell us: have you ever had a pup with allergies and if so, how did you treat them? My wheaten scottie, Fiona, is itchy also. The vet took her thru the antibiotic and pills for itching which worked well. There is a new pill for itching now with good results. I didn't want her on pills every day so researched Din-O-Vite. A natural product made in Kentucky for years. I put her on it in November 2015 - her dose is a TBL twice a day on her food. So far she has gotten to now in WI and just started a 1/2 a benedril twice a day. It's ragweed time plus she HAS to help pick tomatos which make her itch. I use Din-O-Vite's shampoo and give her a bath and that really helps. I don’t claim to be a scientists but most allergies are not environmental but food. Meat and vegetables are natural foods for dogs but not grains. We had our dog tested and tried all the meds available from the vet with no measurable improvement. We started to research kibbles and found most contained grain as a filler. Don’t get me wrong grain does contain nutrition but also tends to bring out itching, licking and chewing of feet and legs. We started our dog on grain free food and after a month or so started to see improvement. After a year or so she was 80% to 90% free of the symptoms. Why not 100%?? No such thing as grain free. Once the dog’s body has reacted to the fillers I don’t think it ever recovers 100%, but 90% is a big step to the comfort of the dog and the owner as well. You should be allergic to weekly vet bills. Our poor Scottie chews his feet constantly when he is awake and or scratches. He would lose his hair about once a year and then it would grow back. But now the only place he has hair now is on his face. The vet finally diagnosed him with mange. Hoping that when we move north to MT he will get better. We are currently living in central Texas. He gets frequent baths, benadryl (when he takes it) & his food is pretty much grain free. He was getting weekly shots of cow urine which seemed to help. Probably will need to start those again. All I can say is good luck! Trey has been biting and gnawing and licking his paws for most of his life. We just got him allergy tested (blood test) and it showed several foods that he's allergic to. It gave us a list of foods that are "safe" for his allergies. We switched his food and put him on prednisone...the vet said he saw a 90% improvement in the redness between his paw pads, but we definitely still see some licking. He said a change in diet could take months to show improvement, though! Good luck to Nibbles! Our Jimmy has environmental allergies which cause hot spots and recurrent ear infections. We finally started him on weekly shots of "Respite" which is allergy therapy especially made with the most common allergens in our area. We're up to week 5 and titrating up for another 5 weeks before we go onto the weekly maintenance dose. Hard to tell this early on if it's successful, but it's been almost 3 months since the last time we had to get his ears cleaned and be on antibiotics. He's also on apoquel and Benadryl for the "itchies." Have you looked into adding a probiotic to her food? Sometimes after few weeks with the "good bacteria" in her diet, these issues will clear up. Been very fortunate not one of my Scots have had allergies. Charles is 7 years old. Allergies started at six months. After many different vets and medications we have his allergies under control. Grain free diet, atopica and ketoconazole daily. He's comfortable, no itching, no hot spots and looks beautiful.